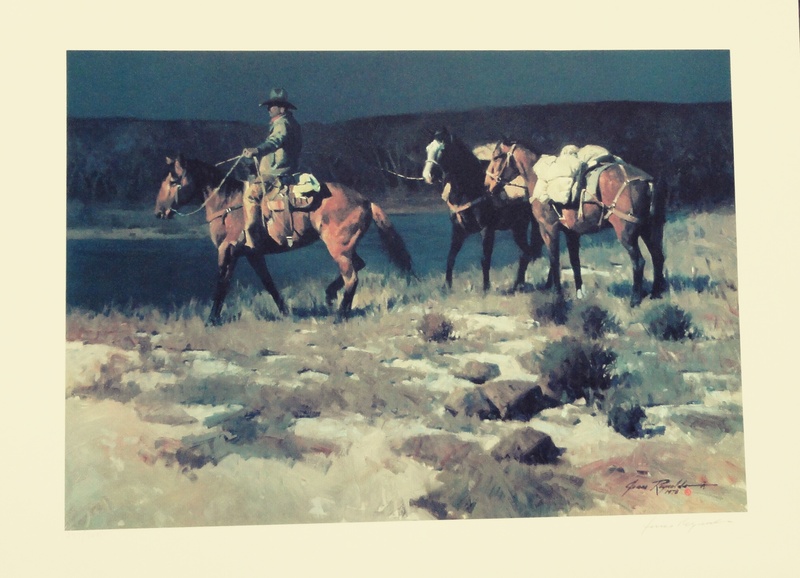 Crossing the Verde by James Reynolds was published in 1979, by Verde Art Enterprises , in an edition size of 300 signed and numbered lithographs. The edition is printed on sturdy acid free archival quality fine art paper. 300 hundred lithographs in the edition make it one of the smallest edition sizes for a James Reynolds artwork, and lends to the scarcity aspect of the edition. It was very seldom sold to, or through galleries, if ever, since it was used by an investor group, over the years, to auction annually at fundraisers for various charities. After many years the remaining prints in the edition are now being made available to Cowboy, and Western Fine Art collectors, James Reynolds fans, specifically, as well as galleries, and art investors. Attractive volume dealer discounts are also available off of full retail. The pricing for the limited edition of Crossing the Verde at several internet art selling websites is currently $319.00, per unframed print.With discounts for buying immediately the price at one site drops 30% to about $224. Our price for a single, signed and numbered, unframed print is $200.00. $150.00 . Attractive volume dealer discounts are also available off of full the full retail price of $319.00. If you would like to donate to this website without buying the print use the donate button on this site. The print measurements are 20 1/2 x 28 inch paper size, 16 x 22 7/8 inch image size. The art for sale is from the original edition of 300 signed and numbered lithographs. Call me at 951 290 2664, or use the contact form if you have any questions, or want to place an order. We want to make sure that you have the opportunity to acquire this work at a competitive price for your collection, or your business. The more you buy, the better the volume pricing.